President Rodrigo Duterte has a suggestion if ever that the ₱1,000 budget for the Commission on Human Rights (CHR) finalized. During his speech after he introduced SPO2 Caneta Rupinta, a former hostage of the New People’s Army (NPA) to the media at the Matina Enclaves in Davao City on September 16, 2017, he suggested that the ₱600-M budget which didn’t gave by the congress to the CHR can be used to buy body cameras to the police. 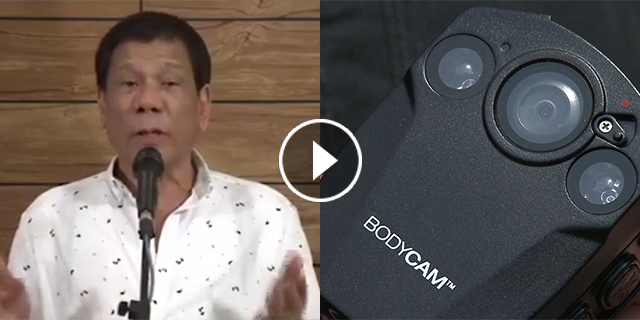 According to him, the ₱600-M can supply body cameras to all police officers and it can make all the anti-crime operations more transparent. “Kung ayaw niyong isauli ang pera diyan sa CHR, why don’t you invest the money to buy equipments for the police, na lahat ng pulis sa Pilipinas it’s about 600 million (pesos) and it can buy it all.. na lagyan sila lahat 24 hours a day ng camera,” The President told the Congress. He said that the cops can remove the cameras on their body if ever that there’s no operation to avoid invading their privacy. President Rodrigo Duterte said that equipments for the police were badly needed because the Philippines is already a narco-state. “The fact that we have mayors and everybody clinging to power in decades, it’s because pinapatay nila yung mga kalaban nila, there’s no election.. pati yung pulis na ayaw sumunod sa kanila pinapatay nila..binabaon nila..” Duterte said. The President clarified that his campaign promises to ‘kill everybody who would destroy the country’ is a message for the organized crime and not for the teenagers. Duterte also warned the big-time criminals that he’s going after their neck next.